Since, Saturday, July 21, it’s been a hectic week for us. On Saturday, we visited the Lowell Thomas Museum in Victor and toured the modern mine of Cripple Creek & Victor Gold Mining Company (CCVG), the Cresson. Monday, we spent two hours at El Pomar Carriage Museum. We headed to Cripple Creek for an all day trip on Tuesday for a guided tour of the Mollie Kathleen Mine and a trip on the Cripple Creek train. Yesterday, during the afternoon, we thoroughly cleaned the motorhome. Yes, we have to do that occasionally. We also had dinner with Bob and Marjorie Card who returned with us for an evening at our motorhome. In between, I’ve been working on cross stitch and transcribing notes from all these visits. Earl has kept busy watching television and processing photos. Since we have done so much, I’m going to divide it into a couple of emails. I’ll first cover the non mining attractions. Stay tuned for a history on mining - since between Mollie Kathleen and CCVG we have viewed the process from 1890 to current day . 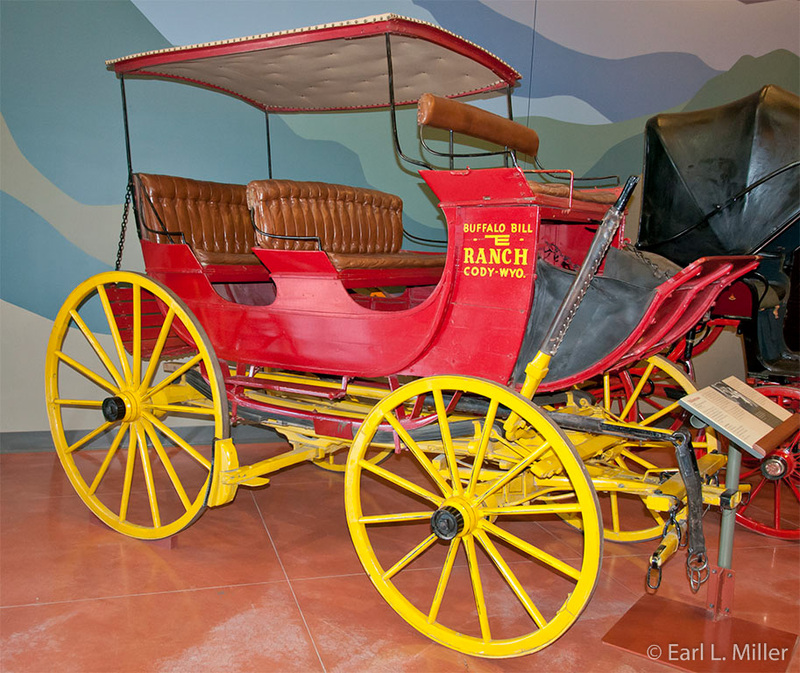 I found El Pomar Carriage Museum to be one of Colorado Springs hidden treasures. While it does not receive the publicity of some of the majors like the Cog Train at Pikes Peak, the Olympics Training Center, or the Air Force Academy, this museum is loaded with historic vehicles. It contains five motor vehicles and 33 carriages. The museum’s collection belonged to Spencer Penrose and his wife Julie. Penrose was responsible for constructing the Pike’s Peak Highway, Colorado Spring’s Cheyenne Mountain Zoo, the Broadmoor Hotel, and the Will Rogers Shrine of the Sun. He was active with real estate holdings including the Cog Railroad which he purchased in 1925. The Penrose name is on many buildings around town. The Penroses established in 1937 the El Pomar Foundation which has contributed over 320 million dollars to civic causes. Originally from Philadelphia, Penrose earned his first $250,000 with partner Charles Tutt from the C.O.D. mine in Cripple Creek. In 1903, Penrose, Charles Tutt, and partner Charles MacNeil set up the Utah Copper Company. The company has another name today - Kenecott Copper Company. The museum’s oldest carriage is the 1841 Brougham which appeared in William Henry Harrison’s Inaugural Parade. Harrison rode a horse that day instead of riding in the carriage. This was a major mistake as he caught pneumonia and died a month later in office. There is information on the Pike’s Peak Race which started in 1916. This includes video clips from the race. It’s the world’s largest hill climb event and the second oldest motor sports competition in the U.S. - only Indy is older. NASCAR fans may recognize the name Bobby Unser who won the Indianapolis 500 three times. He established 13 records in the 18 Pike’s Peak races in which he participated. You can see three cars which have run in the race. 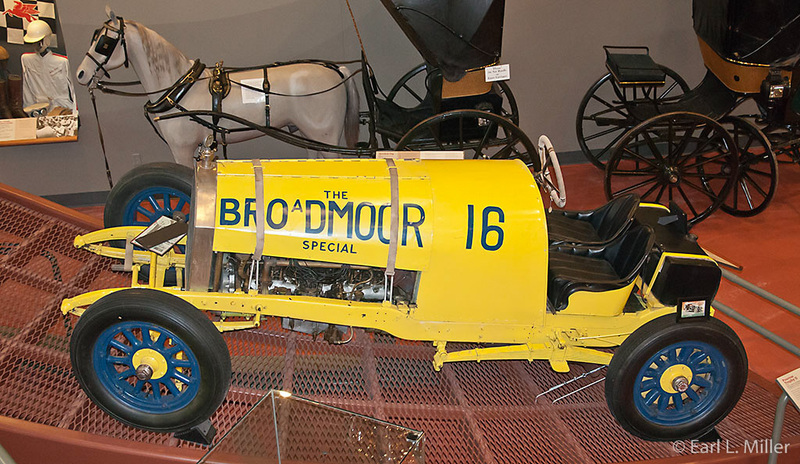 The modified Model T won the race in 1922. Otto Loesche powered the 1920 Lexington to victory in 1920 and 1924. The 1918 Pierce Arrow nicknamed the “Yellow Devil” belonged to Penrose. It was modified from being a touring car to being in the race. His chauffeur and mechanic raced it between 1922-1932 with the best finish being fourth. Called the Broadmoor Special, it was clocked at 90 m.p.h. on the highway east of Cripple Creek, but it was clumsy on Peak curves. Take time when you visit to check out the 1895 Yellowstone Sightseeing Carriage. It belonged to Buffalo Bill Cody, who entertained Theodore Roosevelt, Diamond Jim Brady, and “Death Valley Scotty” at his PT Ranch. The carriage was used for sightseeing tours around Yellowstone. It was housed in the Broadmoor stables and brought out at 10 a.m. and 1:30 p.m. daily to provide rides for Broadmoor guests. You can’t miss the 1928 V-8 Cadillac Imperial coupe. This was an anniversary gift given to Julie Penrose from her husband. The chassis and engine were shipped to Paris for custom work. Her initials are on the rear doors. Take the elevator to the second floor. More carriages are upstairs and this is the place to take time to watch a movie produced by Spencer Penrose on Colorado Spring’s attractions. You’ll also see Penrose’s guns and Native American clothing. Penrose was initiated into the Sioux tribe in 1921 and given the name White Eagle by Chief Iron Bull of the Oglala. You can see Mr. Penrose’s chieftain garment and headdress. The Murtand Collection is also on this floor. Murtand owned the Rock Creek Ranch located south of Cripple Creek from 1882-1890. You can see his saddle, bridal, spurs, lariat, and saddlebag. The museum is located at 11 Lake Circle. Hours are Monday-Saturday 9a.m.-5p.m. and Sunday 1-5p.m. Admission is free. Park next door at the Broadmoor garage and have your ticket validated for three hours of parking. I would expect a museum on Lowell Thomas to be about Lowell Thomas. Only one room in the museum is about him with the exception of the doctor’s bag which belonged to his physician father in another room. The section on Thomas is located on the second floor which you have to climb 26 steps to reach, hardly worth the effort. a signboard describing his life. That’s it. He was born in Ohio in 1892 and died in 1981. He moved to Victor when he was eight years old. At age 19, he edited the Victor Daily News. During World War I, he was sent to Europe by President Wilson to compile a history of the war. Later he worked for CBS and NBC radio networks as a broadcaster doing news and commentary. In all, he spent 46 years on radio and two on television. His retirement took place May 14, 1976. He wrote more than 50 biographies, travel, and adventure books during his life and was the voice behind the Movietone Reel for 20th Century Fox until 1952. The rest of the museum is devoted to information on mining. You can see a replica of a miner’s shack, a 1992/93 centennial quilt, and miner’s lanterns on the first floor. On the second floor, you’ll spot Victorian age women’s clothing, antique toys, dishes, old washing machines and the replica of the office of one of Victor’s early doctors. It’s located at Third and Victor Avenue and is open daily 9:30 a.m.to 5:30 p.m. The admission charge is $6 for adults and $5 for seniors. My advice - skip this one. If you like coal driven, historic, steam trains on narrow gauge tracks you might enjoy a trip on the Cripple Creek Railroad. 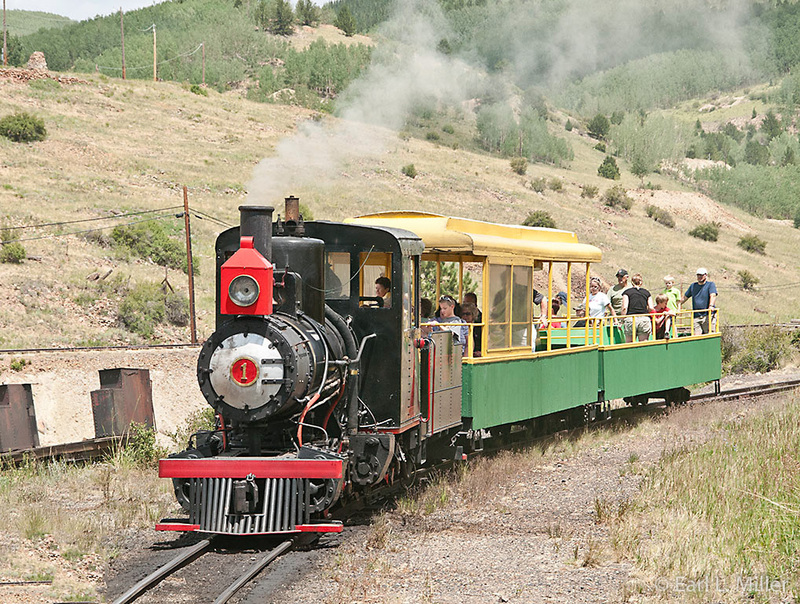 It’s a 45- minute trip that travels two miles each way on a route that leaves and returns from the railroad depot next to Cripple Creek’s District Museum. The route is strong on history and weak on scenery. The depot is the Bull Hill Station. It was built in Anaconda in 1894 by Midland Terminal Railroad. In 1912, it relocated to Bull Hill Northeast of Victor. The M.T.R.R. discontinued service in 1949, and the station was moved to Cripple Creek in 1968. The locomotive pulling two cars (one open, one with windows) is a 0-4-0 type built by Hensher in Germany in 1936. Its prior use is unknown. The car we rode in was a Midland car. The narration on the train is excellent. Three stops are made. At the first stop, our engineer pointed out a number of mines. One, the El Paso Mine, had 30 miles of tunnels and operated until 1976. At the mining peak, over 500 mines existed in Cripple Creek and Victor. He also pointed out prospector holes, also known as glory holes. There are 5,000 of the holes in the area where miners dug down to take out rock before heading to the assay office. At the second stop, you can see where the town of Anaconda existed. Once it had a population of 1,000, now you can only see the blacksmith’s shop. The Mary McKinney Mine was the town’s major support. You can still view from a distance the caretaker’s house, mine office, and powder magazine. You can also see the CVVG Cresson’s leach pad (part of the modern mine we toured). The train backed all the way to the station. It pulled into a siding before we reached the depot, where the engineer related Cripple Creek history. On April 25, 1996, half of the town was destroyed by fire. Four days later the other half burned down. The only wood building that survived was the Colorado Trading and Transfer Company. Look for that building close to the depot. It still survives. In its heyday, Cripple Creek had 35,000 people. Buildings covered what is now vacant land. Some of the homes were sold for back taxes and are currently located at the army base at Fort Carson. Rates are $13 for adults and $12 for seniors. The railroad operates from the end of May to early October. Trains leave, starting at 10:00 a.m. approximately every 40 minutes, until 5:00 p.m. Their gift shop is a great place for books about mining, Cripple Creek, and Victor. I finished my stay at this attraction by purchasing six books. The next email will be about mining. I’ll also tell you about the three railroads that ran from Cripple Creek and Victor. Two went to Colorado Springs and one to Florence. The tracks are now gone, but you can travel their routes by automobile.